I hate soccer, sorry. But who cares ? You, maybe. Because, you see, I enjoyed Red Card more than a soccer-hater like me should have. Red Card is the missing link between the deadly serious simulation like International Superstar Soccer and the deadly fun punchbag like Sega Slam Soccer. In Red Card, you have access to most of the real teams and players (15 teams don't display the real names though) as well to some visually impressive and fun to use power attacks. By using a boost gauge, you can perform some super pass, super tackle or super shot, in other words, you can make your player a superman just the time of an action. And well, it feels good. You don't need to be a soccer fan to enjoy being a super man who kicks the ball so hard that it makes a line of fire and throws the goalkepper into his goal. The effect is enjoyable too, a nice explosion sound, zoom, slow down; grab some pop corn and you feel like being the star of Shaolin Matrix Soccer. What makes it good also makes it weak, because Red Card unfortunaly doesn't have much more to offer than this. Once the fun coming from the super soccer has worn out, and it can be gone pretty quickly, you don't have many options left: enjoying the game for his single mode, a tournament in which you gain some secret teams (they are crazy: samurais, dolphins, martians... but they play like normal teams) and stadiums, or enjoying it with another player, which is frustrating as you can't play in the same team. Both the soccer fan and the video game addicted will regret the lack of options (no statistics, not enough detailed information, no real team editor, too few game modes). The sound is good, especially in the european version with commentaries in 5 different languages, try them all it's cool, but the graphics are average. So, in the end, Red Card is kind of disappoiting. The fun starts high but falls gradually and quickly. His main quality is to mix real soccer and super powers. Red Card could prove itself a good choice still, if you like quick&easy fun or regret the bad Captain Tsubasa isn't released outside Japan. 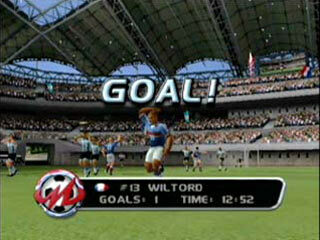 "Finally, a videogame that understands soccer really is a contact sport. RedCard 20-03's unique adrenaline-style gameplay lets you kick, score, celebrate and tackle your way through 50 international teams all vying for the Cup Championship. The unique Midway Sports-style experience combined with lightning game speed, stunning next-generation graphics and authentic soccer action make RedCard 20-03 the must-have soccer title on the next-gen systems. So, all you Soccer Moms cover your eyes. RedCard 20-03 - Different Game. Different Rules." 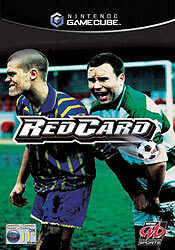 "- RedCard 20-03 - fast, hard-core adrenaline-style soccer. 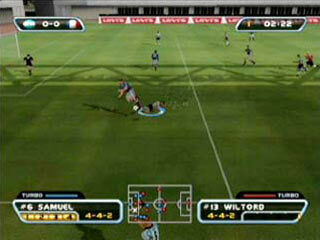 - RedCard 20-03 Gameplay - All different types of exaggerated kicks, mind-bending jukes and daring tackles. Also motion-captured animations such as bike, flip, and scissor-kicks as well as extreme footwork, dekes and quick passing from the feet and head. - 11-on-11 gameplay - Each team will have 10 players and a goalie. 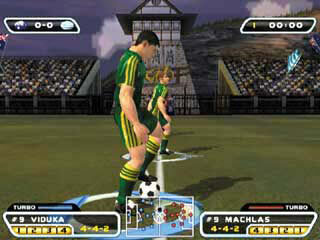 Each of the characters has the ability to be under the players' control, one at a time. - Game Modes - Four distinct game modes to enjoy: Finals Mode, a battle through 32 qualified national teams for the Cup - Championship; World Conquest Mode, beat all 50 national teams and 7 fantasy teams to conquer the world; Friendly Mode, where players can hone their skills against any and all competition; Tournament Mode, where the battle for the Cup begins. - International Pageantry - fanatical fans rain cheers or jeers from the swollen stadium above. - Rewards - Skilled players can unlock modes, teams, stadiums, etc. Winning allows players to strengthen their team with additional attribute points. - Stadiums - Visually stunning environments with realistic texturing. - Total Soccer - FIFPRO license, national teams, national players and real stadiums like Saitama, Daegu and Yokohama. - Exclusive TIME-WARP-SLOW-MO-BLUR camera effects."